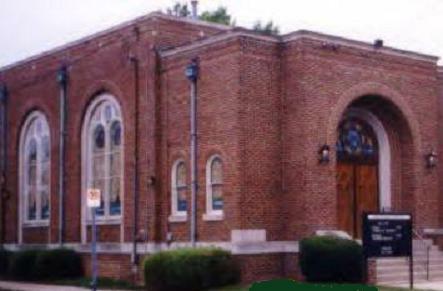 Beth Israel Congregation (בית ישראל‎) is a synagogue located at 50 North 6th Street in Hamilton, Ohio, north of Cincinnati. In 1901, it was organized by eight families as an Orthodox alternative to Hamilton’s existing Reform congregation that was founded in the 1880s and located on High Street. Beth Israel moved to the Conservative movement and became egalitarian in the 1980’s. The founding members were Yiddish-speaking immigrants, more traditional than Hamilton’s existing English speaking Jewish community of around 250 families. The new congregation initially worshiped in their members homes, and then to a converted warehouse on Hamilton’s east side at the corner of Fifth and Charles streets. In its early years it was served by a series of temporary rabbis. In 1911, it obtained a charter from the State of Ohio as Bais Israel Congregation. By 1919, under the leadership of Rabbi J.H. Goodman, the congregation comprised 42 member families. Services were held in Hebrew and the congregation’s religious school had 45 students with classes held daily. In 1923, the Ladies Auxiliary was formed and purchased land at Sixth and Butler in 1929. The congregation sold its existing building and began worshiping at a temporary location on Main Street. That year the rabbi was Gabriel Zakuta. The current synagogue building at 50 North 6th Street was completed in 1931. It consisted of a main sanctuary capable of seating 200, a social hall and a kitchen. At the time the congregation had 60 member families. Visiting Zionist leaders used the new social hall to raise money for the creation of the State of Israel. The Great Depression caused the congregation significant financial distress. Rabbi Zakuta’s salary was cut in half to $25.00 per week, and his contract was cancelled. He left in 1933 and was replaced by Bernard Kalchman. In 1939, the congregation opened a religious school. Post World War II – Rabbi Kalchman left in 1946 and was succeeded the following year by Murray Gershon. Rabbi Gershon initiated late Friday night services. He left the following year and was replaced by Joseph Krickstein, who served until his retirement in the 1960s. Rabbi Krickstein was followed by Rabbis Leopold Kagan, Meyer Minkowvich, Irael Dworkin, Max Newman, Edward Portnoy and Seth Phillips. Rabbi Phillips was followed by Mark Washofsky. In 1960, an addition of offices and class rooms were added to the synagogue building. In 1964, a chapel multi-purpose room was added. In 1984 the congregation voted to count women in the minyan. That year Bruce Adler joined as rabbi. In 1985, Beth Israel elected its first woman president and voted to call women to the Torah. Rabbi Adler left in 1997 and Eric Slaton joined as rabbi in 1999. In 2011, the congregation celebrated its 100th anniversary. Besides celebrating with delicious food, activities included extracting a time capsule filled with documents and artifacts buried in the cornerstone of the synagogue building, and replacing it with copies of the existing material plus new artifacts.